The difference between Rural Organics and other “organic” organisations is that we are mentoring the entry of Australian landholders (primarily growers in the outback), processors, as well as exporters, into organic and bio dynamic markets. We have ‘hands on’ practical experience and a general understanding of all sections of the industry. We can provide you with information including relevant documentation which is required for your products. 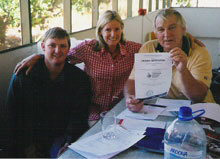 Rural Organics through its subsidiary ORA has successfully brought together many government organisations with an interest in organic certification; and so has created properties North, South, East and West of the Darling River a single resource centre for Landholders – therefore simplifying the entire organic and bio dynamic certification procedure. Finally, Rural Organics believes that sustainable farming systems are inherently diverse because nature is diverse and sustainable farming must be carried out in harmony with agriculture.